We buy computer motherboards (and any other cicuitboard as well) and pay you for the precious metals (such as gold, platinum, silver, and palladium) found inside them. Check out what other computer scrap has value or what we buy. 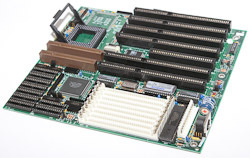 The motherboard is the large circuit board that connects the innards of the PC together. All the components communicate with each other through the motherboard. The motherboard is rich in precious metals and has several of the most valuable parts of the PC attached to it. We do not accept motherboards which are made of fiberglass. These are identifiable by their bright colors, usually blue, yellow, or red. These boards are often worth less than $0.15 a pound because there is virtually no precious metal on these. To get started, please contact us, or send us details about your motherboards for a price estimate and shipping arrangments. There are minimum quantities for shipping circuit boards to ensure your profitability (generally 50-100lbs), but we can evaluate your boards to find the right shipping strategy. Intel 486 Motherboard from the 1990s.